A club lead defeats 6 – but not 6 . Once West had ben able tomake a lead directing double you can understand why NS stayed low. It was next to impossible for West to lead a club – the only way to defeat the slam. Declarer won the spade lead in dummy and played three rounds of trumps. With diamonds behaving he was home, for a 13 IMP pick-up. Did I mention that you could always make 6 ? 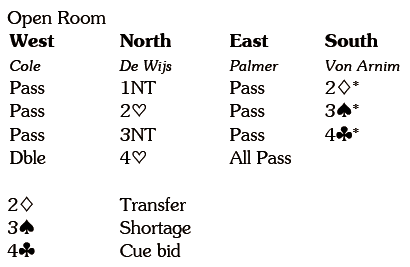 In the Open Room NS stopped in 4 for +680. When South offered North a choice of slams she went with her chunky diamond suit. 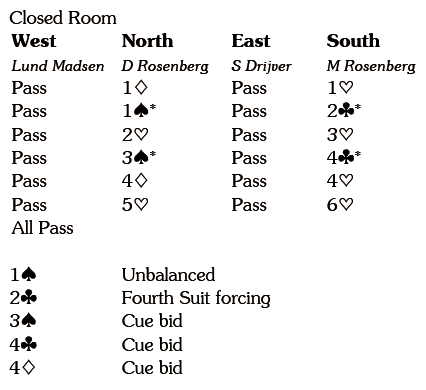 East led the 8 – essential, otherwise declarer will have an entry to dummy after establishing the hearts – and West won with the king and returned the six, declarer taking East’s queen with dummy’s ace and pitching a spade on the 10. 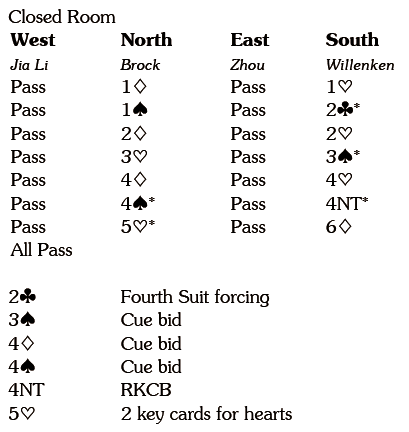 A spade to the ace was followed by a spade ruff, a diamond to the ace, a spade ruff and then three rounds of hearts. West ruffed in with the J, but declarer overuffed, cashed the Q and claimed when the remaining trumps divided. Not a bad way to collect 12 IMPs.